Some Pocono resorts have cross-country skiing trails and equipment rentals are readily available for those interested in the sport. Cross-country skiing packages are occasionally available with your accommodations (ask when booking your room). Cross County is one of the least expensive of the snow sports (except for the rentals). 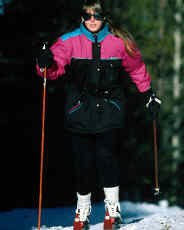 Many resorts allow guests to cross-country ski for free on the resort property. There are, however, other cross-country areas in state parks and state forests. A few of the area Golf courses are available for this sport. In Analomink, the Evergreen Golf Course, 421-7721, which is part of the Penn Hills couples resort � 421-6464 has marked trails, for beginners and advanced skiers. There is a trail fee, and rental and trail fee packages. There is no snow making so these trails are open only when weather permits. Promised Land State Park - Hwy. 390, Promised Land Village � 676-3428 There are lots of hiking trails in Promised Land Sate Park that crisscross between state park lands and the Delaware Forest lands. These trails are often used in the winter by cross-country skiers. (Go only when there is snow). The park office in Promised Land is open Monday through Friday during the winter from 8 AM to 4 PM. The nearest town you can ski to is Promised Land Village, which abuts state lands. West End Mauch Chunk Lake Park - 625 Lentz Tr., Jim Thorpe � 325-3669 Here you can ski on the switchback rail line. The trail was built on an old railroad bed so it has a consistent incline, which means a tough ski up or a very easy ski down the trail. We think you might want to start at the top of the trail and ski down. Equipment rentals are available at the local sports stores. There is no fee to use the trail. Delaware Water Gap National Recreation Area - US Hwy. 209, Shawnee to Dingmans Ferry � 588-2451 There are three trails for cross-country skiing. One in New Jersey at the Kittatinny center, (908) 496-4458. The second at Slateford Farm, south of the town of Delaware Water Gap. Take the first road to the right after passing south through the gap. The Slateford Farm trail is on a mountainside so there is a variety of topography. There are some flat areas in fields and more difficult trails through the woods. It's free to use this area. The third trail is in Flatbrookville and requires a serious commitment to get there. Go up the river road on the NJ side of the river. Follow signs to Flatbrookville. Look for the Blue Mountain Trail.